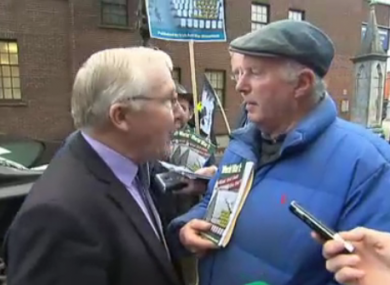 Christy Burke told protesters that nothing would be achieved by his refusing to attend the event. CHRISTY BURKE SQUARED up to a protester outside yesterday’s Remembrance Day ceremony at St Patrick’s Cathedral as the man told the Dublin Lord Mayor he was “ashamed” of him for attending. As Burke stepped out of his car outside the cathedral yesterday, he was met by a small group of protesters. The interaction was captured by RTÉ, with one of the men telling him he would “prefer if you didn’t go in”. After a bit of back-and-forth between himself and the man, in which Burke said he was probably more of a Republican than any the protesters, he asked the man what his alternative would be. “My alternative is to ignore these people,” he responded. “For 800 years, by ignoring people, people lost lives,” he told the man, adding that he should “get wise”. If you want to have a history debate, pal, I’ll see you after this – now it’s not a thick you’re talking to. The feisty Lord Mayor was then reminded by one of his staff that it was time to go inside and he ended the interaction with the protesters with handshakes and smiles all round. Email “'The dead is the dead' - Dublin's Lord Mayor squares up to Remembrance Day protester”. Feedback on “'The dead is the dead' - Dublin's Lord Mayor squares up to Remembrance Day protester”.